Save Money, Say No To The Kids And Teach Them In The ProcessEliminate The Muda! When my son was a toddler he came home every day with a new toy. Thomas the Tank Engine was the most common. About the time we began getting serious about our finances I made the mistake intelligent decision to add up the cost of all his toy trains one day. Facing several thousand in debt and no closer to a down payment for a house I realized that we had spent nearly $2000 on little wooden trains! Saying no to our kids became a priority. I will admit it wasn’t easy but in the end it saved us thousands and it turned out it was one of the best things we could have done for the kids. Did you grow up with guidance from a parent or guardian on money matters? Most of us didn’t and I was one of those that was determined to provide my children a better foundation. The first challenge in learning to say no is not facing how the kids will react; it’s facing your own feelings. Parents have an innate ability to want to spend on their kids; toys and lessons and sports activities galore. By doing so, are we not setting our kids up for great pains when they grow up? Will they simply learn to expect everything to be handed to them? If we keep lavishing our children with everything will they be able to learn the value of hard work or the almighty dollar? Not likely! As parents we must recognize that some tough love is actually one of the best things we can give our child. Learning to say no may be difficult but has the ability to teach some lifelong lessons in the process. Look at saying no in the positive light, as an excuse to teach your children good lessons. When you say no, go further. Explain to your child why it is important to be frugal with money, “save for a rainy day”, and prepare for future needs. When you say no, use it as an opportnity to teach your children to be resistant from marketing. 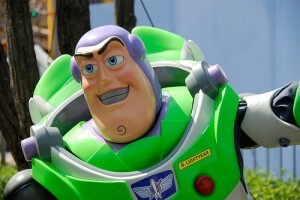 My son was once enamored with a commercial about a Buzz Lightyear that he believed could fly. The commercial certainly made it look that way. When the day finally came that he was able to bring this Buzz home he was devastated thinking he received a defective Buzz. For years I have used this experience as a lesson in the realities of marketing and advertising. As a result there have been many other “flying” toys that he has not succumbed to. When you say no, use it as an opportunity to engage them in earning what they want. Offer them opportunities to earn money around the house and match their efforts. If they really want that Buzz let them work for it and learn work ethic along the way. When you say no, use it as an opportunity to help your children learn to set goals and objectives. After all if they had every thing they wanted what would there be to look forward to. Help them understand that it is not realistic or fun to have everthing, they need to set priorities and work for their goals. When you say no to your children you are not being a bad parent you are being a great parent. Admit it, the best things you ever had in life were generally not things, they were experiences and lessons. What you were given toys they never lasted forever, but what you have learned from your parents and mentors have been gifts that keep on giving. Do you have kids? What methods do you use to limit the spending? Please share your tricks of the trade. Comment below so other parents can learn as well.